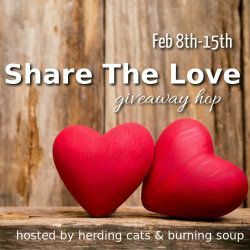 Thanks so much for stopping by the Share the Love Blog Hop! I’ve selected three blogs that I’m loving at the moment and would love to spread the word. Here’s how you can help! Follow all three on Facebook via the Rafflecopter giveaway. As a thank you, I’m giving away a complimentary bottle of chocolate marshmallow balsamic vinegar from Mix Party. 650,000 Hours – What I love about this blog is the message of stepping outside of our comfort zone, understanding the power of small gestures, and success comes from helping others succeed. And Ken’s hysterical, so you really need to like his Facebook page and read his blog! When Tara Met Blog – I recently connected with Tara on Twitter after she sent me a note that she liked my holiday romance Christmas Dinner, and I love her lifestyle, travel, and parenting blog. Highly recommend stopping by because she really has something for everyone (Moms! You will love her posts!) Also, give her Facebook page a like. Pure Jonel – I love Jonel! She’s been such a supporter of my writing journey – and that of so many other romance authors. In addition to reviews, she post interviews and giveaways and just makes being a romance reader so much fun. Please give her Facebook page a like. Thanks you for giving these three some love! Make sure you complete the rafflecopter to be entered in my giveaway. Finally, why did I choose Mix Party for a giveaway? My very good friend, Jill LeVesque, is a Mix Party mixologist so of course I want to support her! You can learn more about Mix Party and check out their super fun bottles here. Thanks for stopping by! Now hop to the next! Thanks for the giveaway. I’ve never heard of Mix Party before and had to look it up. The vinegar sounds amazing! I LOVE LOVE LOVE S’mores. I eat them about once a month. So the fact that these are considered a “liquid S’more” has got me intrigued. Hey Kristin! Thanks for stopping by! Doesn’t it sound delicious?!?! Thanks so much for offering these opportunities, Anna! I love your blog hops!